Luxury hotels have wheelchair accessible room(s) that are more spacious than regular rooms. These rooms usually have a bigger bathroom. However, they do not always have such rooms available. So you have to call the hotel directly to make your reservation, instead of booking online. And they do not usually offer a discount room rate. but charge the fixed rates. We can sometimes stay there using a discount rate. All hotels have wheelchair accessible restrooms in the public area. Generally, hotel buildings and restaurants are wheelchair accessible, but some boutique hotels may not be wheelchair friendly. In Japan, mid-class hotels ( 6,000yen - 12,000yen per night ) are generally called business hotels because they are very often used by people on business trips. Many of these hotels are located in convenient areas, close to railway stations. 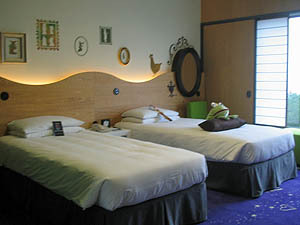 Rooms are usually very small in size, mostly one bed, and do not have many twin/double rooms. Some hotels are popular for having big public baths. New hotels are legally required to have a wheelchair accessible guestroom, but usually they only have one. In most cases, you cannot book online and must make a call for reservation. Some business hotels even offer you breakfast with the reasonable room charge. The bathroom in each room has a step at the door. But those hotels have a wheelchair accessible public restroom near the reception on ground floor. So you can use the toilet in the reception area if you cannot use the bathroom in your room. And if you do not mind skipping taking a shower for a night, choosing a cheaper hotel could be an option. In Japan, you will not find many hostels compared to other parts of the world. We are getting more hostels for foreign backpacker tourists, but it is not so common among Japanese travelers. One of the reasons probably is because there are already many reasonable business hotels everywhere. If you want to cut your budget, one option may be to stay at an internet cafe, where they offer overnight package ( 980yen - 1,480yen ). Saunas in urban areas or temporary sleeping room at rural hot springs offer cheaper prices ( 2,000yen - 3,000yen ), but may not be comfortable and safe enough for foreigners to stay. Many of them are located in busy areas and may have steps and barriers. Capsule Hotel is another option. Feel very unique Japanese sleeping facility. Many Japanese traditional inns ( ryokan ) are located in hot spring areas, targeting groups and families. You share a big Japanese style tatami mat room with your group and sleep on mattresses laid out on the floor. Charges are usually for one night and two meals. People stay at ryokan to enjoy hot spring and delicious food. You might see Japanese group tourists enjoying Karaoke in the party space room, and sometimes even joined by Geisha girls. Many of these ryokan buildings are old and not barrier-free. But recently, we see more of them offering universal rooms for wheelchair guests and elderly people. The charges for these rooms may be higher, sometimes close to a deluxe room. However they are spacious, and you can even have a private hot spring bath in your room, which is very luxurious. 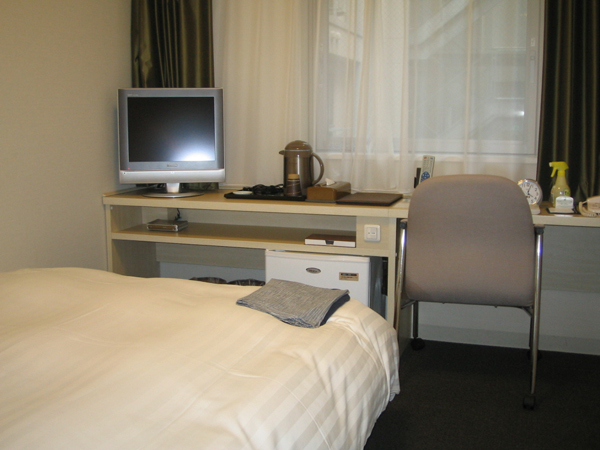 Some public welfare facilities offer spacious and gorgeous rooms at very reasonable rates. The disadvantage, however, is their locations. Not many are located in the central areas, but rather in suburbs together with other welfare related facilities. Some have limited opening hours and other regulations, but some are open to non-Japanese tourists as well. If you are traveling with a group on a bus, or you have a severe disability, or you are driving a rental car, these facilities may be an option.